This large club turn-out divided into two teams - Keith, Andrew and Tony set off for Main Rising in Speedwell and the rest for a tourist and photographic trip in the main system. The Speedwell party detoured to take in the bottom of JH and on the way back from Main Rising explored the passage which contains the miners' inscriptions. 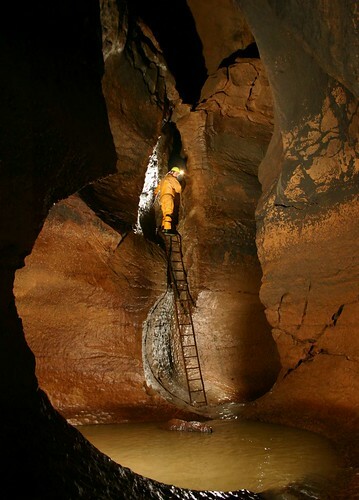 This passage ends in a large chamber with a very impressive waterfall. The two parties met up by Lake Sump and left the system in three groups. Graham Smith at Lake Sump. Adrian Stanley climbing out of the Main Streamway at Surprise View.